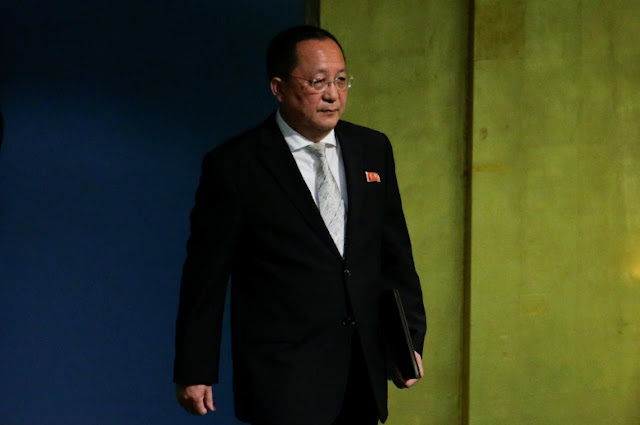 North Korean Foreign Minister Ri Yong-ho arrives to address the 72nd United Nations General Assembly at U.N. headquarters in New York, U.S., September 23, 2017. UNITED NATIONS/WASHINGTON/SEOUL - North Korea said on Saturday that firing its rockets at the U.S. mainland was “inevitable” after U.S. President Donald Trump called Pyongyang’s leader “rocket man”, in a further escalation of rhetoric between the two leaders. North Korean Foreign Minister Ri Yong Ho’s remarks before the United Nations General Assembly came hours after U.S. Air Force B-1B Lancer bombers escorted by fighter jets flew in international airspace over waters east of North Korea, in a show of force the Pentagon said demonstrated the range of military options available to Trump. Trump announced new U.S. sanctions on Thursday that he said allow targeting of companies and institutions that finance and facilitate trade with North Korea. Earlier this month the U.N. Security Council unanimously adopted its ninth round of sanctions on Pyongyang to counter its nuclear and ballistic missiles programs. The U.S. bombers’ flight was the farthest north of the demilitarized zone separating North and South Korea that any U.S. fighter jet or bomber has flown in the 21st century, the Pentagon said. Ri warned Pyongyang was ready to defend itself if the U.S. showed any sign of conducting a “decapitating operation on our headquarters or military attack against our country”. An official of South Korea’s Meteorological Agency said acoustic waves should be detected in the event of a man-made earthquake. All of North Korea’s six nuclear tests registered as earthquakes of magnitude 4.3 or above. The last test registered as a 6.3 magnitude quake. Trump told the U.N. on Tuesday the United States would “totally destroy” North Korea if it threatened the United States or its allies. North Korea’s Foreign Minister Ri Yong Ho told the United Nations on Saturday that U.S. President Donald Trump had made “our rockets’ visit to the entire U.S. mainland inevitable” by calling North Korean leader Kim Jong Un “rocket man”.